PAIR Uploader v3.0 is a tool for uploading EFS-ready documents in bulk to PAIR. After initial setup, users can drag and drop EFS-ready documents into the corresponding categories/folders and the tool takes care of the rest. Max-Insight premium users can download the tool for free. If the link is not enabled, please subscribe/upgrade to Max-Insight premium account to access all the patent tools or click here to contact the Insight support team. Click setup.exe followed by the Run button to start installation. Click the 'Certificate Settings' button and browse the certificate and enter the password in pop up window. 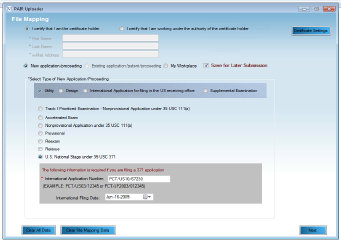 The tool has a main screen where the user enters application information. After filling the application data, the user can upload files by dragging and dropping into the respective category. Document categories and document descriptions are displayed in tree structure. The user can drag single/multiple files from any folder and drop them onto the respective document description. The files dropped to each document description will be shown in a list based on the selected description. 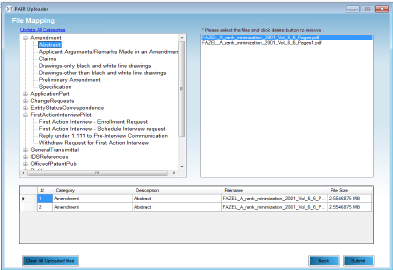 The user can also remove any files from the list before submitting them to USPTO PAIR. 'Update All Categories' button is provided to update the categories from USPTO. 'Clear All Uploaded Files' button is provided to clear the files dropped into respective categories. 'Submit' button is provided to start the upload process. The crawler will open the USPTO Private PAIR login page in a new web browser. 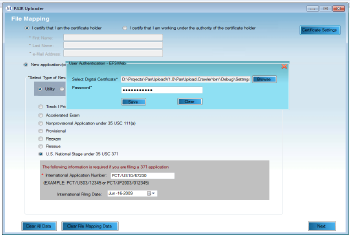 Then the crawler will automatically navigate to e-filing (Registered) page and start to fill the application data such as e-filer details, application details, inventor details etc., which were provided in the input screen of the tool. Files dropped in each category of the tools page will be uploaded to the respective categories in USPTO Private PAIR. The upload process ends after all the files are uploaded and validated.